The Cambridge Animal Alphabet series celebrates Cambridge's connections with animals through literature, art, science and society. Here, O is for Owl, the researchers using their wing structure to inspire aeroacoustic developments, and the lavish drawings of them found in one of the world's first ornithologies. Scroll to the end of the article to listen to the podcast. Owls fly silently: not all species of owl but those species that rely on stealth in hunting small animals. People have known this for hundreds of years but until recently no-one has understood quite how these magical birds manage to swoop undetected on their scurrying prey. The puzzle of how the wings of certain species of owls are adapted to minimise the sound that their wings make has been solved by a partnership between researchers at the University of Cambridge and two institutions in the USA. The key to the puzzle lies in the intricate structure of owls’ feathers – and especially the plumage on the trailing edge of their wings. The researchers have now been able to replicate this structure by producing a prototype surface (patented in 2014) which has potential applications in wind turbines and a wide range of fans. Its use could significantly reduce the noise generated by these products. An especially promising end-use for the surface is for on-shore wind turbines which are heavily ‘braked’ to reduce noise pollution. The braking makes the turbines less efficient. 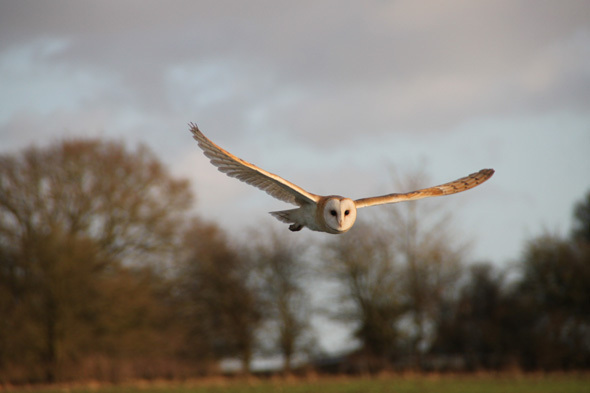 The story began in 2010 when Dr Justin Jaworksi, then a researcher in the Department of Applied Mathematics and Theoretical Physics (DAMTP) at Cambridge University, decided to look in detail at the structure of owls’ wings. At DAMTP, Jaworski (who is now at Lehigh University) worked with Professor Nigel Peake, a specialist in aeroacoustics known for his work on aircraft, to identify how owls’ wings differed from those of other birds. They found three key differences. 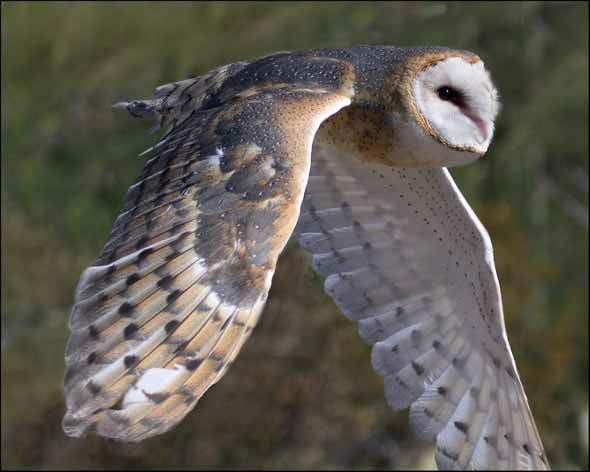 The first difference, unrelated to silent flight, is that owls’ wings are have a serrated leading edge in a way that enables them to plunge steeply downwards and then take off again. The other two differences combine to enable owls to fly stealthily so that they can hear their prey without it hearing them. “The feathers on the upper wing surface have a particularly detailed and complex micro-structure with layer upon layer of interleaved barbs and hairs,” said Peake. Much of the noise from wings – whether the wing of bird, plane or fan – originates at the trailing edge where the air passing over the wing surface becomes suddenly turbulent. Owls have a neat solution to this problem. “At the trailing edge of their wings, owl feathers produce a flexible and porous fringe which reduces air turbulence by smoothing the passage of air,” said Peake. No other species of bird possesses these features. Even more significantly, species of owl (such as fish owls) not requiring an acoustic stealth advantage do not possess them either. To understand how the features unique to owl wings contribute to soundlessness, and in order to replicate the surfaces created, Jaworski and Peake have been collaborating with Professors William Devenport at Virginia Tech and Stewart Glegg at Florida Atlantic University in a project funded by the US Office of Naval Research. “We used advanced mathematical tools in a wind tunnel to show that the role of the fringe on owls’ wings is to negate something called the ‘Flowes Williams and Hall effect’. The porous elastic fringe filaments are a much softer ‘sound scatterer’ than a sharp rigid edge,” said Peake. The role of the complex feather structure is more of a mystery but the collaborators have been able, to some extent, to replicate its effect in the laboratory. “What appears to be crucial is the way that the fine hairs form a ‘canopy’ perhaps shielding the basal surface of the wing from pressure fluctuations in the turbulent air flow,” said Peake. "The whole project has been very exciting. We’ve been able to use advanced mathematics to understand an amazing natural phenomenon, which then inspired us to develop a practical engineering solution to a really challenging noise pollution problem." The intricate structure of owl’s wings was noted more than 300 years ago by Francis Willughby (1635 to 1672), the polymath who compiled one of the world’s first comprehensive and analytical ornithologies. 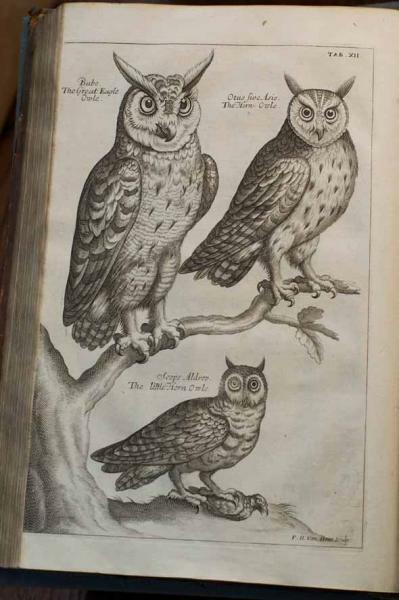 Several species of owl feature in Willughby’s Ornithologia libri tres which was published by his more famous friend and colleague John Ray (1627 to 1705). Willughby studied at Trinity College, Cambridge, where the Wren Library holds a copy of the ornithology he authored. The lavishly produced volume contains dozens of plates showing birds categorised by their characteristics. The accompanying text reveals Willughby’s passionate interest in the wonders of the natural world. Willughby studied at Trinity College, Cambridge, where the Wren Library holds a copy of the ornithology he authored. The lavishly produced volume contains dozens of plates showing birds categorised by their characteristics. The author of the stunning drawings is not recorded. Next in the Cambridge Animal Alphabet: P is for critters that are part of one of the most significant of all human-animal relationships. Have you missed the series so far? Catch up on Medium here. Inset images: Barn owl in flight (Chris Thompson); Barn Owl (Pat Gaines); Owls from Ornithologia libri tres by Francis Willughby (Wren Library, Trinity College).